Thanks to Blacktail for the link! In the early 1970s, the United States Navy, following the doctrine of Chief of Naval Operations Admiral Elmo Zumwalt for larger numbers of smaller and cheaper ships, initiated design studies for a "minimum-cost" carrier of 50,000–60,000 tons. The new design was planned to be much cheaper than nuclear-powered carriers (a cost target of $550 million was set in 1972) but still be suitable for replacing the ageing Midway-class aircraft carriers. [nb 2] Work on the project (designated T-CBL) was stopped however, when the US Congress made statements encouraging all major warships to be nuclear-powered, and in 1976 an order was placed for a fourth nuclear-powered Nimitz-class aircraft carrier. 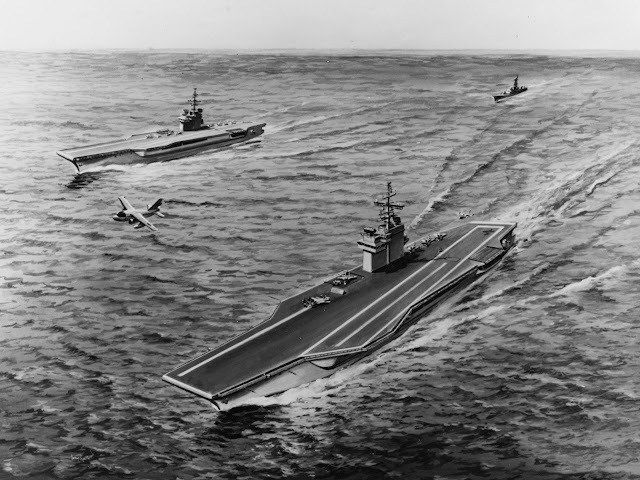 Later that year, however, US President Gerald Ford cancelled the order for the fourth Nimitz, stating that instead, two CVVs, medium-sized, conventional-powered carriers which were expected to mainly operate V/STOL aircraft would be built. The existing T-CBL design formed the basis for the new CVV, this being of the required size, while capable of operating all existing conventional carrier aircraft (this proved important as the hoped-for supersonic V/STOL fighters did not come to fruition). The CVV carried a smaller airgroup than existing supercarriers (i.e. about 60 compared with about 90 for the nuclear-powered Nimitz class or the conventional-powered Kitty Hawk-class aircraft carriers) and had two steam catapults rather than four and three arrestor cables instead of four. The CVV also had a less powerful power plant, with steam turbines fed by six boilers generating 100,000 shaft horsepower (75,000 kW) in a two-shaft arrangement, compared with the 280,000 shaft horsepower (210,000 kW) delivered to four shafts of the larger carriers, giving a speed of 28 knots (52 km/h) compared with over 31 knots (57 km/h). While slower than earlier carriers, this was still sufficiently fast to keep up with carrier task forces. Not all of the design features in the CVV were less capable than earlier carriers, however, as the carrier was planned to have improved protection for the ship's magazines and to be protected against under-keel explosions. This article points out two issues about the USMC's plan to use LHDs as light carriers. 1. They wouldn't carry enough fast jets to make it a viable option. 2. Current USN carriers are underutilized. The current class of ships is designed to operate over 100 aircraft. They have been operating with just over half that number for over a decade. The Navy needs less aircraft carriers or more airplanes. It doesn't need more decks. Additionally if we were to size our carriers for the number of aircraft we have in service then by my rough count we could probably go down to 6. Yeah. Let that sink in. If we were to operate our carriers with the number of aircraft they're designed to have on deck then we could shed HALF our carriers, put about 100 aircraft on each of the remaining flat tops, save money, free up escorts and still have the same striking power.